An ancient enemy. An unresolved conflict. An evolving world. It’s time to end this war! On the heels of the fleeing alien invaders, Rizelya and Blazel discover their ancient enemies, the Malvers, have escaped their island prison and are coming home to avenge their exile on the war-weary Posairs. But the Posairs no longer have anyone with the Black Talent needed to fight the near immortal Malvers. Can Rizelya and Blazel find a way to vanquish their enemies, once and for all? At last, Malviana and her people are free from the wretched island of their exile! But the world—and the Posairs—isn’t the same as when she’d been banished centuries ago. Faced with new and frightening powers, will Malviana manage to exact her vengeance? White Priestess Wisah learns she is the key to a powerful weapon, and it’s the only one capable of killing Malviana. But if she unleashes it, it could destroy her world—and her soul. Will she choose to risk her soul or let the Malvers enslave her people? 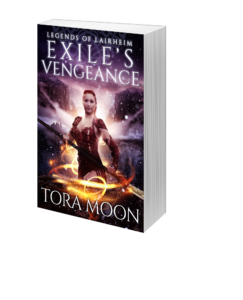 Exile’s Vengeance is the exciting conclusion to the war between the Posairs and Malvers in the Legends of Lairheim series. If you love innovative magic, strong female leaders, and battles with monsters, you’ll love Tora Moon’s epic fantasy series, the Legends of Lairheim. Read Exile’s Vengeance to end the war today!